A charming vintage Childs toy carpenters tool kit . Rular, pliers, screwdriver, 2 hammers and saw . The contents are excellent, the box scruffy. This is adorable. 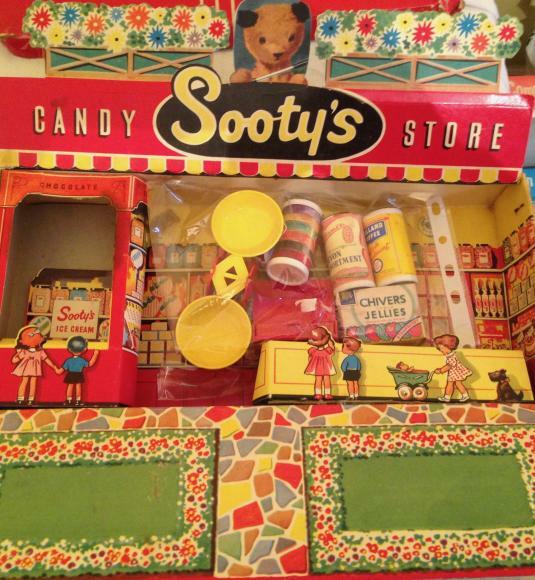 Its a cardboard sooty Candy Store which opens up to make a shop . 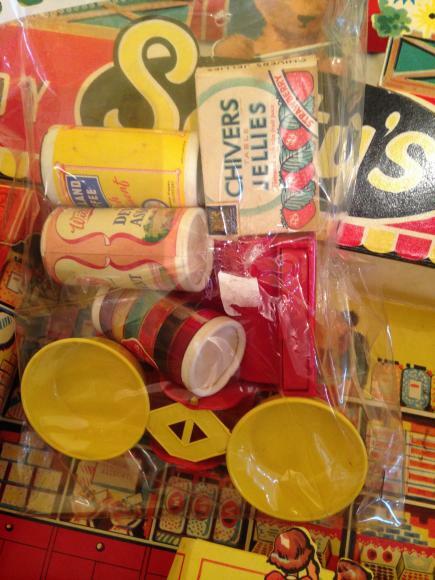 Comes with a selection of miniature packaging . The shop is in excellent condition but the box lid is a bit tatty. Dating from the 1970s, this is the classic chip cutter by Nutbrown. The box is a bit tatty. early zig zag 364p wooden jigsaw couple with girl and dog. A lovely vintage c 1925 wooden jigsaw by Zig Zag which has 364 pieces. It depicts a period couple with a small girl and her dog. Complete and in. excellent condition but the box is a bot scruffy. A 1930s pair of 3" diameter inflatable Aero Tyres by Frog International Model Aircraft co. The tyres are in good condition, the box isnt. The classic 1960s International Travel game Go by Waddingtons. It is complete with the blank cheques, currency converter and the rules. Box lid is a bit worn.